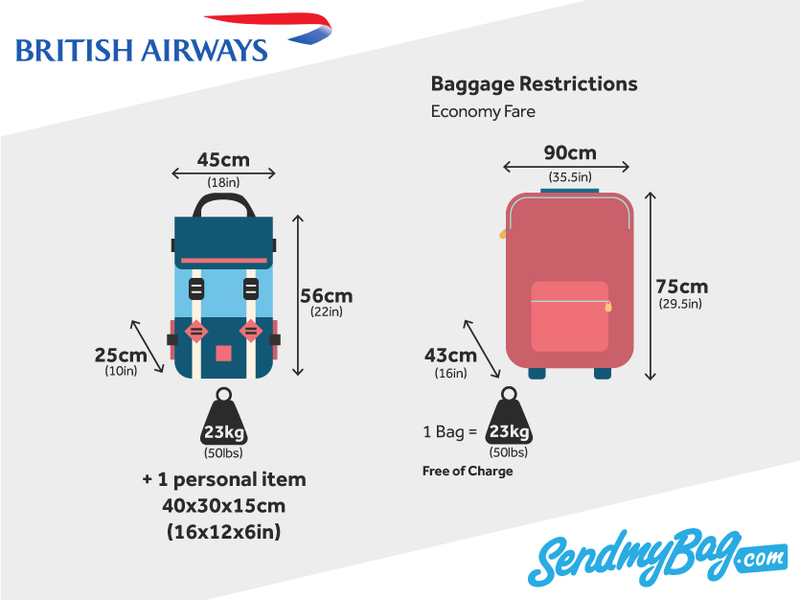 What are British Airways' Baggage Size Restrictions and Excess Baggage Fees? Find Out Before You Travel. British Airways' baggage allowance shouldn't limit what you bring abroad with you. If you need more luggage at your destination than you can bring on the plane, then simply ship your luggage with Send My Bag. This way you also get to enjoy a luggage-free journey and the ability to progress quickly through the airport and onto your final destination. Get a free quote for sending your luggage to your particular destination. One larger item of hand luggage measuring 56 x 45 x 25 cm, plus one personal item (such as a laptop or handbag) measuring 40 x 30 x 15 cm. Each bag must weigh no more than 23 kg. Infants under two years of age are only permitted one cabin bag, for items they may need during the flight. Compare British Airways' hand luggage allowance to that of other airlines. If a bag exceeds the dimensions or weight permitted by British Airways’ baggage allowance, or if a passenger has more than two items of hand luggage, these excess items will be placed in the hold. If this means the customer has now exceeded their checked baggage allowance, they will be charged a fee. When travelling with an infant under two years of age sitting on your lap, you will be able to bring an additional baby bag with you onto the plane as carry-on luggage. If a seat is purchased for the infant, they are entitled to the same hand luggage allowance as an adult. What Items Are Not Permitted in BA Hand Luggage? On most flights the Economy allowance is one item of luggage up to 23 kg. The dimensions of a checked bag must not exceed 90 x 75 x 43 cm. The number of permitted checked items varies according to the customer’s fare type and route. On routes between London and Doha passengers may check one item up to 32 kg. The following routes allow two items of baggage that weigh up to a maximum of 23 kg each: To and from Ghana, Kenya, Liberia, Nigeria and Sierra Leone; connecting between India and USA/Bermuda/Canada; connecting from Saudi Arabia to USA/Bermuda/Canada. 'Hand baggage only’ fares do not include a checked baggage allowance, but an allowance can be purchased at checkout, with prices ranging from £20 to £40 for the first bag to be checked, and from £36 to £60 for each additional bag. These fees increase if they are paid at the airport, rather than online. For travel to/ from London Heathrow and many major European destinations, for example, it would cost £25 to check in a bag at the airport. Elite fare types provide higher luggage allowances. If bags weigh more than the passenger’s baggage allowance permits, the passenger will be required to pay £65 per bag that is overweight. Many exceptional baggage items, such as sports equipment and musical instruments, can be checked as part of British Airways’ baggage allowance. British Airways are currently waiving a fee for large items up to 190 x 75 x 65 cm. In an unusual announcement, BA have said that they will be boarding passengers according to how much they have paid for their ticket.That means that those passengers who have paid the least for their ticket will be boarded last. This is likely to reveal to fellow passengers who got the best deal for similar seats. Looking for British Airways sized hand luggage?